Data Mining Book – Chapter Download. Download this immediately useful book chapter, and learn how to create derived variables, which allow the statistical and Data Science modeling to incorporate human insights. 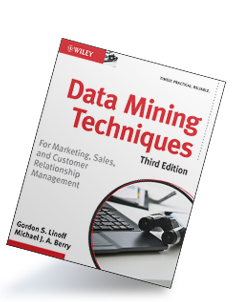 Download this chapter from Data Mining Techniques, Third Edition, by Gordon Linoff and Michael Berry, and learn how to create derived variables, which allow the statistical modeling process to incorporate human insights. As much art as science, selecting variables for modeling is "one of the most creative parts of the data mining process," according to the authors. The chapter begins with a story about modeling customer attrition in the cell phone industry, moves to a review of several classic variable combinations, and then offers guidelines for the creation of derived variables. "The best data miners and modelers rely on intuition as well as expertise. Visual exploration is the best way to develop intuition for what is going on in a data set."